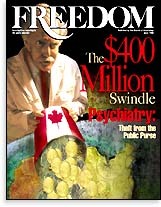 In the last issue of Freedom we exposed the full story of Leilani Muir who, along with thousands of other Canadians, was sterilized by psychiatrists acting on precisely the same philosophy that gave the world the Holocaust  the racial hygiene of eugenics. In this issue we take another look at psychiatry. Consider this: an estimated $400 million tax dollars were siphoned off into psychiatric hands in the last decade in just one aspect of psychiatric fraud  the abuse of medical insurance. We cover this and related matters in detail in this issue. Available also in Portable Document Format (PDF).